World Report: Who Is Sibel Edmonds? 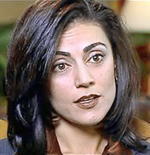 Sibel Edmonds was a contract translator hired by the FBI shortly after September 11, 2001 for her knowledge of Middle Eastern languages. She was fired in short order (March 2002) after reporting shoddy work and security breaches that could have prevented the attacks to her supervisors. Among the best known knee jerks is the use of national security to justify secrecy, just as terrorism is used to justify war. One of the defining characteristics of the Iraq war has been the dramatic significance of conservatives, high-ranking military officers, and intelligence personnel who have stepped forward at nearly every point to expose dishonesty, sloppy work and worse by the Bush regime. In this podcast, Scott Horton interviews Sibel Edmonds and James Bamford about State Secrets Privilege. Bamford was the Producer for ABC's World News Tonight with Peter Jennings for nearly a decade. In 1983k he wrote The Puzzle Palace, the first book ever written about the US National Security Administration. In April 2001, his new book on the NSA, Body of Secrets was published. This time, instead of threatening to prosecute him for a breach of national security, the NSA granted Bamford unprecedented access to Crypto City (the NSA campus in Ft. Meade, MD), senior NSA officials, and thousands of NSA documents. This ACLU page lays out the generalities of the court case and includes numerous links including text, audio and video.